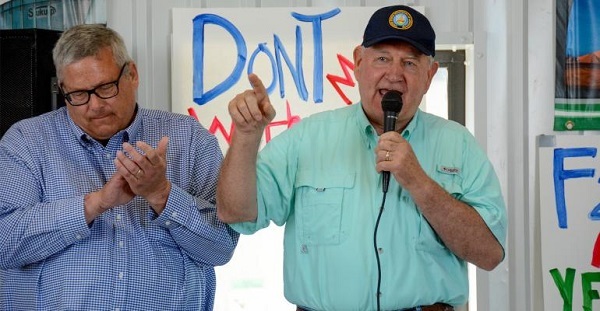 Touring the 2018 Farm Progress Show at Boone, Iowa, U.S. Secretary of Agriculture Sonny Perdue heard the concerns of farmers. Bill Northey, USDA undersecretary for farm programs and conservation, accompanied Perdue on the walk. Northey served as Iowa ag secretary until accepting the USDA appointment six months ago. They answered questions at each stop, addressing concerns such as tariffs and trade uncertainty, the new USDA farm financial aid program, and year-round use of E15 ethanol. Asked how he responds when farmers say they want "trade, not aid," Perdue noted, "I say, 'Amen.' There is not a farmer in America who wouldn't rather have a good crop at a fair price than a government check. But since U.S. agriculture is heavily dependent on exports, it's important to help out the farmers adversely affected by the current trade situation." Corn growers told Perdue they were disappointed corn is scheduled to receive just a penny per bushel for losses incurred in this year's tariff disputes with key foreign buyers. Kevin Skunes, National Corn Growers Association president, said the federal government's $12 billion aid package fails to account for losses corn growers have suffered from tariffs, especially on ethanol and dried distillers grain. "Corn prices have declined about 44 cents a bushel, or $6.3 billion," said Skunes, citing an industry study. "We don't feel this is fair and equitable." Perdue said the USDA corn payment is based on "calculations of actual tariff disruption damage to the crop. The numbers are the numbers. These are calculations we may have to defend in court," given a possible World Trade Organization challenge. He noted that the damage corn has had from tariff retaliation is minimal compared to soybeans and other commodities. USDA's emergency aid program provides close to $5 billion in direct aid to farmers hurt by trade disputes, including $3.6 billion for soybean farmers and $96 million for corn farmers. This amounts to about 1 cent per bushel for corn and $1.65 per bushel for soybeans. Soybeans from the U.S. face a 25% import tariff in China, the leading buyer of U.S. soy exports. Farmers will initially receive payment for only half of their 2018 crops, with a second round of payments possibly this coming year. "I would prefer that this compensation be more," Perdue said. The trade impact of the tariff war is significant in Iowa, the nation's leading producer of corn and pork and second-leading producer of soybeans. Economists point out that it's difficult to calculate how much the prices of farm products have fallen due to trade disruptions or how much comes from larger production. At a renewable fuels rally at the Farm Progress Show, Perdue said President Donald Trump called him that morning to say Trump wants the federal government to allow year-round sale of E15 ethanol. "The president says let's get it done," Perdue said. "We've got to work this out and talk with corn growers and the ethanol community and the fuel refiners about how we can find a balance." Iowa farmers and biofuel supporters urged Perdue to keep the pressure on EPA to stop issuing waivers to refineries, allowing them to avoid blending ethanol and biodiesel into gasoline and diesel fuel. "The petroleum industry needs to follow the law on blending requirements, as set by the Renewable Fuel Standard," said Monte Shaw, executive director of the Iowa Renewable Fuels Association. "EPA's blocking of expanded E15 use and granting the small refinery waivers has led to destruction of demand for ethanol and biodiesel." Perdue was asked about replacing the North American Free Trade Agreement (NAFTA), as Trump recently announced a new agreement with Mexico. "We're pleased with the Mexico agreement," Perdue said. "We hope it will lead to an agreement with Canada, too." Perdue is also hoping for an agreement with the Chinese government to trade with the U.S. without tariffs. "We'd love to have the China deal done very quickly; unfortunately, that's up to China. They've unfairly retaliated against our exports to their country, with tariffs and other trade issues." Responding to farmers' concerns that irreparable long-term damage has been done to U.S. trading relationships around the world because of Trump's tariff policy, Perdue said, "I don't believe we've done irreparable damage long term. The United States - when we get these trade disputes resolved - needs to continue to be known as a reliable supplier, and I think we will be." However, he acknowleged it may take a while to regain some markets. Perdue is hopeful Congress can complete a new farm bill before the Sept. 30 expiration date of the current bill. "The House and Senate are anxious to get that done," especially with the uncertainty over trade, he said.